We had a nice quiet day at home. Robbie worked on his assignment for the mini-mester class and I read some of the Wellness Journey workshop materials. I got my new daily devotional ready for tomorrow - I've used the same one for the past six years and it was falling apart. We finished the nativity scene puzzle. I put up the 2011 calendars and Robbie made us a wonderful New Year's Eve meal of prime rib & baked potato. We decided to switch around some of the 12 Days of Christmas movies so we could watch The Two Towers , the second movie in The Lord of the Rings series, this evening. We are looking forward to the New Year! I have to admit that when I woke up Wednesday morning, I thought "only three more days for the December daily posts!" It seems many of our days have been so similar lately that I was sure y'all were getting tired of reading about us playing dominoes and watching movies, and I was almost out of ideas for photos to document our days at home. Then I got a call from my nephew which turned these two days into a house full of guests and lots of fun! 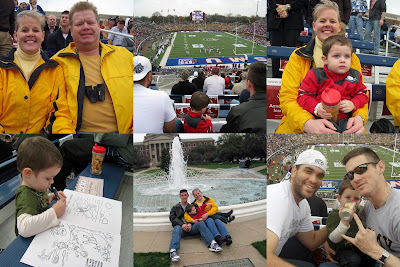 Trey called at noon to ask if he and Andrew and his buddy Eric could crash here that night because the Army was giving him free tickets to the Armed Forces Bowl in Dallas at SMU on Thursday. I spent the next couple of hours cleaning house and putting on a huge pot of spaghetti for supper. I was almost finished when Mama & Daddy showed up for a visit. Mama had finished another of the pillows she made us as anniversary gifts! 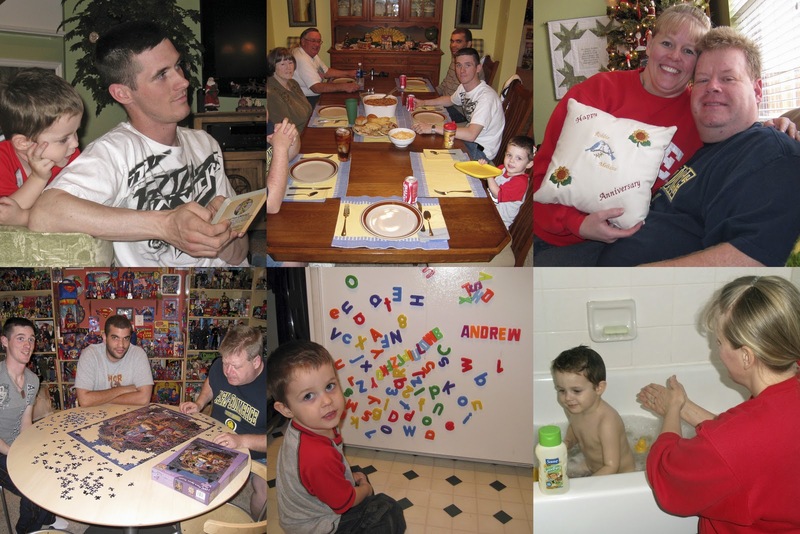 We played dominoes until Trey, Andrew & Eric arrived, then we all enjoyed supper before Mama & Daddy headed home. I gave Andrew a bath and we all watched The Fantastic Four movie. Robbie, Trey & Eric worked on the puzzle while I put Andrew to bed. When Trey picked up his free tickets on Wednesday, he mentioned that he would be staying with family so they gave him tickets for us too. The Armed Forces Bowl started at SMU at 11 am, so the five of us were up and all ready to go by 9 am. We parked on the other side of the SMU campus and enjoyed the walk to the stadium as we had never been on the campus before. It was full of game day activities, a really nice campus even on a gray windy winter day. Army won the game against SMU 16 to 14.﻿ We took Trey & Andrew & Eric out to eat at La Finca Chiquita on the way home, and after a short visit here they headed back to Killeen. We watched The Lord of the Rings: Fellowship of the Rings movie before heading to bed. During the game, they paid tribute to each of the five branches of the military by having current, past & retired members of each branch stand as they played their song. Here's Trey's buddy Eric standing and being recognized for his previous service in the Marine Corps. And here's Trey standing as an active soldier in the United States Army. Trey is currently based in Fort Hood, Texas, but is being deployed to South Korea in February. He was here for our family get-together, however I had not anticipated seeing him again before he left for South Korea, so I really enjoyed this visit! Overall, a fun two days and we are enjoying a nice quiet day at home today, ready to ring in the new year. I ran a few errands this morning and packed up the Christmas dishes, linens, puzzles, and wrapping papers this afternoon. Robbie spent most of the day working on his research project. We watched the Cold Turkey movie while we finished off Christmas leftovers for supper. We had a very competitive game of dominoes, and I also took time to read all the pre-class materials for the Wellness Journey Workshop that starts Thursday. exchanges - it went very smoothly and we returned home with more items (for the same money) than we left here with. We enjoyed a nice meal out for lunch at Rafain's today in celebration of our 9th Anniversary. We had a nice quiet afternoon and watched the movie Rodan this evening. This week of the countdown is a week to rest from all our efforts for Christmas Day. We are continuing to celebrate the 12 Days of Christmas by watching movies from the list we created in week one. 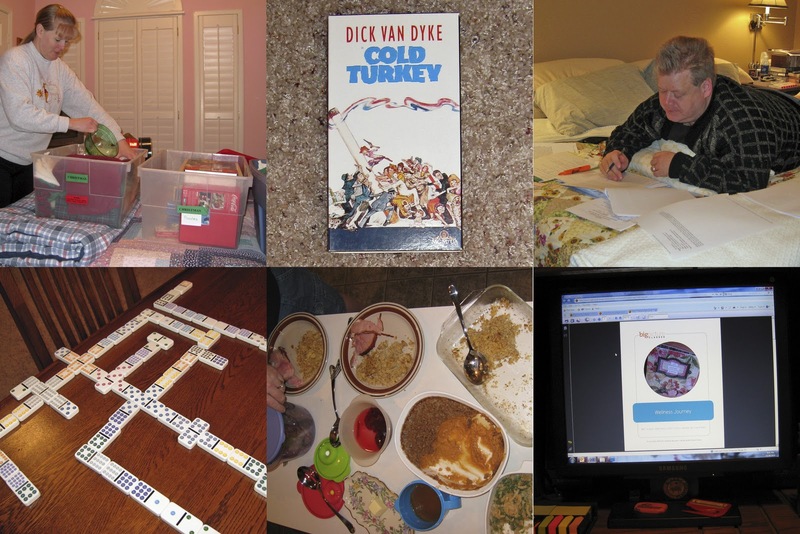 I have continued my daily blog posts with photo collages for each day of December and will be working on my mini-album the first two weeks in January. This week we are also refocusing on healthy eating and getting back into our exercise routines. 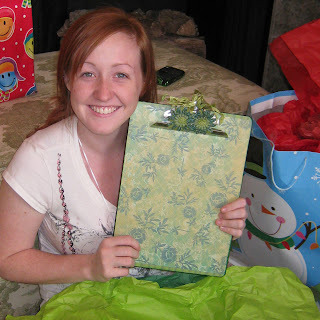 I will begin to put away some of our Christmas items starting with the dishes, clothes, and wrapping papers. My plan is to slowly put things away and then to take down the three main Christmas trees on January 6. I also completed an After Christmas Review about the things we liked or disliked this year and what we'd like to do different next year. *putting up the Christmas decorations went very smoothly as we only brought a few boxes down from the attic at a time. We put out those items (first the big trees, then the small trees, etc. ), then put the boxes back up in the attic before bringing down a few more. All our boxes are labeled, so I was able to pick out what we needed next. *how festive the house looked after we decorated. *having lots of time together throughout the holiday season, playing dominoes, putting together puzzles, watching movies. *having all the handmade gifts completed & wrapped before Thanksgiving. *hosting the family get-together here at our home. *the traditions that we enjoy each year - wrapping each other's gifts a few days before Christmas, Christmas Eve Communion Service, taking turns unwrapping and enjoying each gift, serving pie at 10 o'clock on Christmas Day, watching The Nativity Story on Christmas Day. *Having too many sweets in the house between events tests my will power - I failed that test this year and ate way too many! *I am less motivated to exercise during the few weeks before Christmas even though I have time to - make it a point to exercise early in the day as often as possible to avoid so many missed sessions. *I would like to make my Christmas cards next year - start early, maybe in September! This week was also about thank yous, being sure to send thanks for gifts or events. 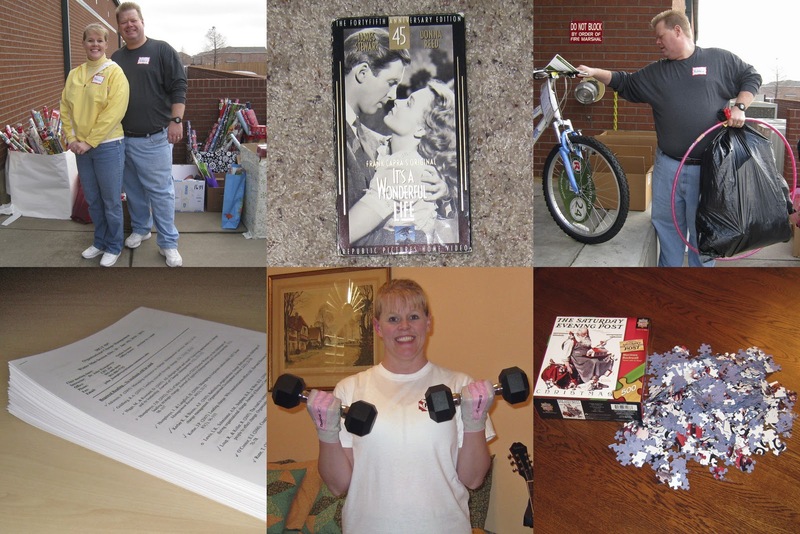 We were able to thank everyone either in person or with a phone call for our gifts this year; however I did send a couple of emails and make an additional phone call with special thanks for some of our gifts. We are looking forward to a quiet New Year's Eve here at home. Robbie will be making prime rib for our New Year's Eve meal and I will be making cabbage, ham, cornbread and black-eyed peas for a traditional New Year's Day meal. We enjoyed a relaxing day at home. We tried on our new clothes (unfortunately we have a few returns/exchanges) and began processing our Christmas gifts. 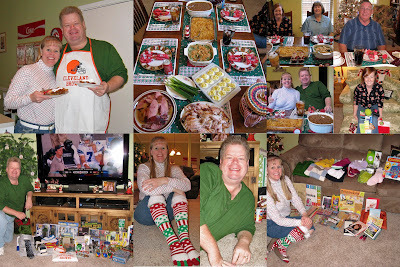 We enjoyed Christmas dinner leftovers for every meal and watched the Cleveland Browns game. 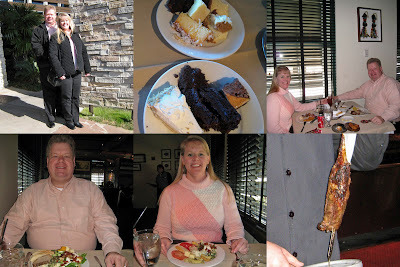 I did all the laundry, paid bills, processed a little bit of paperwork, and updated my blog - my usual Monday chores that I wanted to get out of the way so we could enjoy our anniversary on Monday. 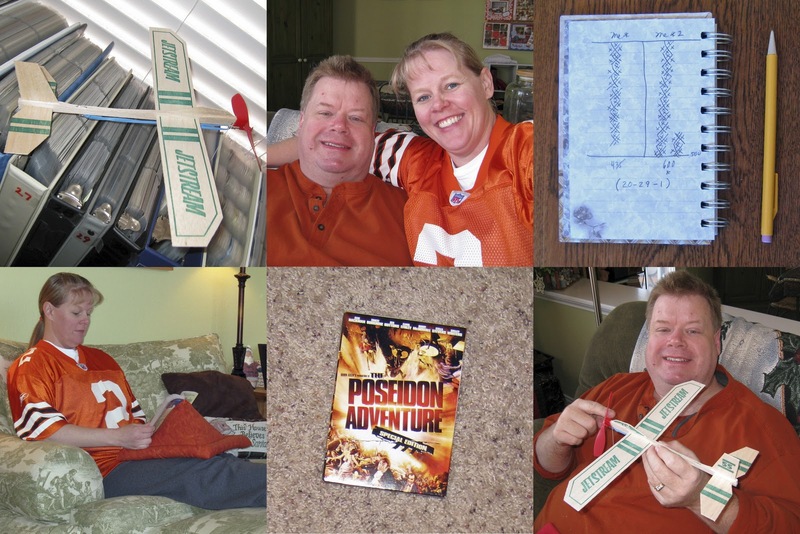 We watched The Poseidon Adventure (the movie we chose for the First Day of Christmas). A late game of dominoes proved I'm not any better with the double fifteens than I was with the double twelves! 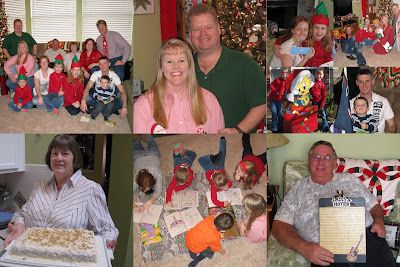 We had a wonderful Christmas Day! 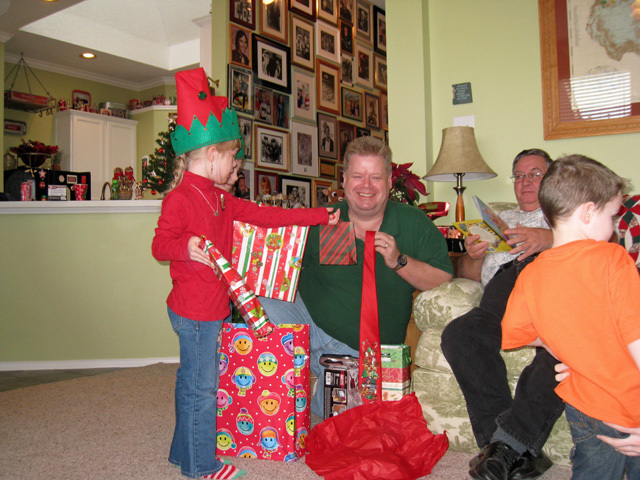 We immediately began opening gifts, taking turns and enjoying each gift. 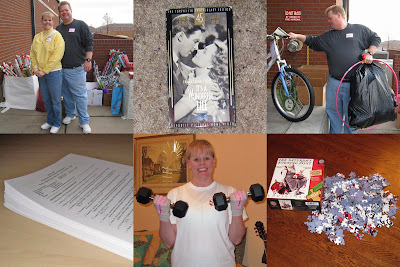 I received some wonderful scrapbooking tools & supplies, exercise clothes & equipment, calendars, books, clothes, socks, a DVD and a Connect Four game. Robbie received collectible toys to add to his evergrowing collection, a calendar, books, clothes, socks, a Cleveland Browns apron, small tools for working on models, and Double Fifteen Dominoes. Nichole arrived around 10 o'clock, just in time for our traditional serving of pecan pie. We played quite a few games of Connect Four. Mama & Daddy arrived a little later and we all opened the gifts in our stockings. 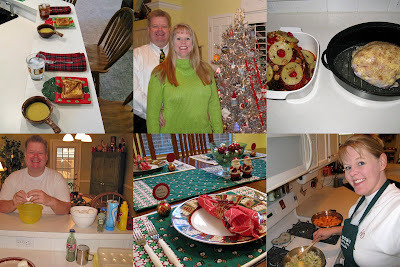 We enjoyed Christmas Dinner around 1 pm - turkey breast, ham, cornbread dressing, mashed potatoes, gravy, praline sweet potatoes, green bean casserole, cranberry sauce, deviled eggs, and rolls. Then we all played dominoes, which took quite some time as we got used to the new dominoes! Nichole left around 3pm and we watched The Nativity Story movie, a great reminder of the True Reason for the Season. We played another round of dominoes before Mama & Daddy headed home, then Robbie and I watched the Dallas Cowboys game. We finished off a perfect day relaxing in front of the fireplace, thankful for all our blessings. We were up early and Robbie made Breakfast Burritos, then we watched The Year Without a Santa Claus . We were both yawning after the movie and decided to take a little nap, which was very refreshing! I made grilled cheese sandwiches and soup for lunch, then we spent the afternoon on preparations for Christmas dinner. Robbie made deviled eggs, seasoned the turkey breast, and prepared the glaze and garnishments for the ham. I prepared the praline sweet potatoes, cornbread dressing, and green bean casserole, and set the table (using my cute ornament name place holders that I purchased in London a couple of years ago!). 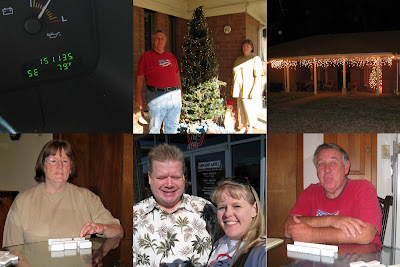 We drove through the neighborhood to see Christmas lights on our way to the Christmas Eve Candlelight Communion service at church. We watched the 1970s version of Miracle on 34th Street before turning in for the night. After all that beautiful weather earlier in the week, the weather turned cold and rainy, but at least I was finally able to wear my new coat! The Christmas Clutter Countdown continues throughout the entire holiday season, which ends with Epiphany on January 6, so we have two more weeks. This past week was Christmas week and our main focus was to finish up any last minute items and enjoy the holiday. We’ve had a wonderful Christmas celebration this year. Last Saturday my family was here for our family get-together – it went exceptionally well. During the week we worked on Christmas puzzles and enjoyed Christmas movies almost every day, including The Nativity Story on Christmas Day. 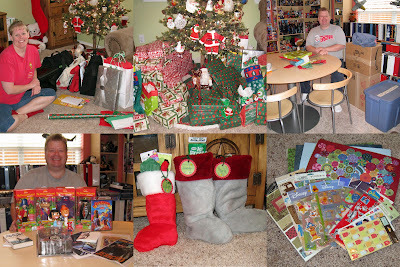 On Wednesday, we wrapped Christmas gifts for each other and filled stockings. We attended the Christmas Eve Communion Service at our church. Christmas Day was wonderful. 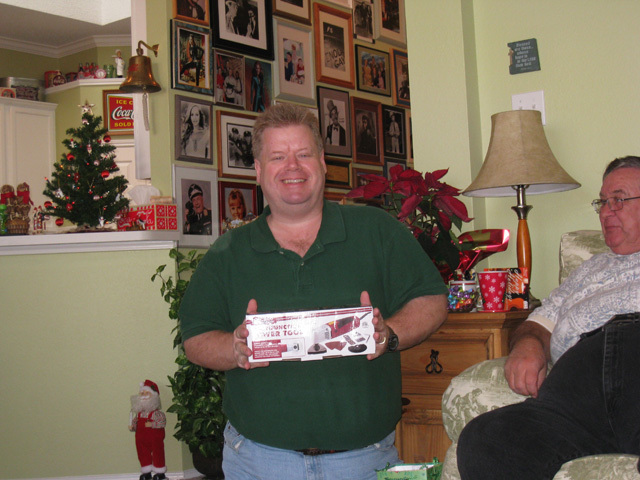 Robbie and I exchanged gifts Christmas morning. My niece arrived in time for our 10 o’clock tradition of serving pie (usually after Christmas Dinner everyone is too full for dessert until much later, so we always serve pie at 10am to be sure we enjoy some dessert – it also tides us over until dinner, usually served around 1pm). My parents arrived around noon and the five of us opened the gifts in our stockings. (We fill stockings for anyone spending Christmas Day with us.) Robbie and I prepared the entire Christmas Dinner and I must admit that it was delicious. We had completed all the prep work on Thursday and Friday, so everything went very smoothly yesterday. We had turkey breast, ham, cornbread dressing, mashed potatoes, gravy, praline sweet potatoes, green bean casserole, rolls, cranberry sauce, and deviled eggs. We played games and then watched The Nativity Story . After everyone headed home, we watched the Dallas Cowboys lose their game! I continued with a daily post to document our December (although I need to do the 24th & 25th a little later today when I’ve had time to upload the photos). I also worked some on the mini-album I’m creating for December. All our Christmas gifts are spread out in the living room and I’ve begun processing some of them today. We tried on all our new clothes (and unfortunately have a couple of returns/exchanges) and I’m working on the laundry now. We decided this year to watch a different movie each evening for the 12 Days of Christmas. Tonight will be The Poseidon Adventure . You can see our list of movies and how we came up with them here. I even snuck in a little bit of decluttering this week! One of my Christmas turtlenecks was too small when I tried it on (now I remember why I didn't wear it last year!) so it went into the donation bag. And one of the Christmas puzzles we've been working on went in the bag also. We enjoy puzzles all year long and especially having a puzzle going on the table all through the holiday season. The snow scene puzzle was ok but not one we enjoyed enough to put together again and again each year. I hope each of you had a wonderful Christmas and are looking forward to continuing to enjoy the holiday season for the next 12 days. From our home to yours - Merry Christmas. May your holiday be filled with many blessings as we celebrate the birth of our Savior - Jesus Christ! I started Christmas dinner prep today - the turkey and ham are thawed, eggs (for deviled eggs) are boiled, pecan pie is baked, and cornbread is ready to be made into dressing. Robbie braved the grocery store to pick up a few items. 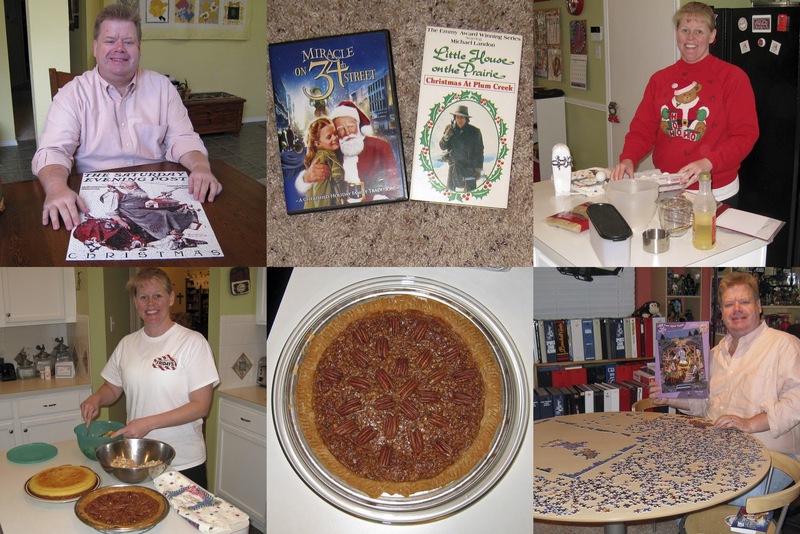 We watched the Little House on the Prairie episode of Christmas at Plum Creek and the 1947 black and white version of Miracle on 34th Street . We finished the Saturday Evening Post Santa puzzle and started a new one of the nativity scene. I spent the evening working on my December mini-album and listening to the Papperclipping Roundtable. Gift Wrapping Day! We always choose a day the week of Christmas to wrap our gifts from each other. We gather all our gifts and supplies in different rooms (but close enough that we can still talk to each other), have Christmas carols playing in the background, wrap all the gifts and fill the stockings. We both really enjoy it and will say things like "oh, this is such a great gift, you're going to love it" and "I can hardly wait for you to open this one." I also filled stockings for family members who will be spending Christmas Day with us, and we received two packages from Robbie's friend Jeff in the mail. Robbie got new collectible figures and a DVD, and I got a whole batch of new stickers and 12x12 patterned and die cut papers! We watched two Christmas episodes of Bewitched today. I worked on my December daily album and completed the first four days. I worked more on it today (Thursday) and completed through the 12th, which is all the photos I have printed. My plan is to print the remaining photo collages the first week of January and have the album complete by January 15. Here are a few of the completed pages. Hope y'all are having a great Christmas week! An early morning as we volunteered for the 7am to 9am shift for ACO's Christmas toy distribution helping load donated toys and bicycles. Robbie started his Winter Minimester class today by printing out a huge stack of reading material. I'm trying to stay on track with my exercise, but not doing as well as I would like this month, so I made a special effort to get my strength training routine in today. Completed my usual Monday chores - paying bills, processing paperwork, doing laundry. We started a new puzzle and watched It's A Wonderful Life this evening. We attended the morning worship service at church this morning, then watched the Cowboys game (occasionally switching over to check on the Browns game). Robbie made mini-hamburgers for lunch served on Hawaiian buns. We relaxed most of the afternoon, playing one game of dominoes. I took a nice long bubble bath and headed to bed early so I could catch up on some magazine reading. 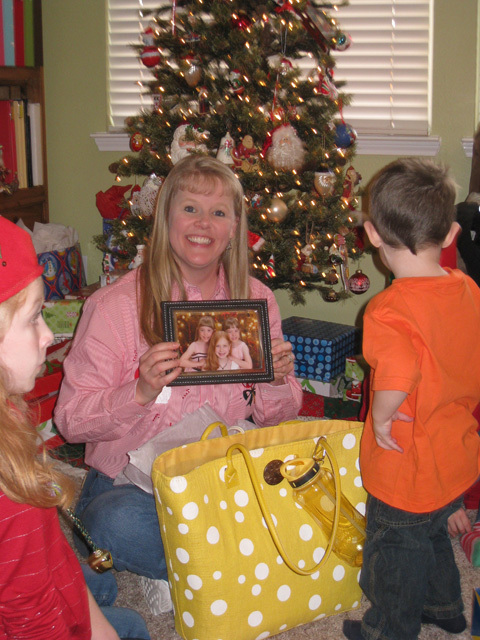 Here are some of the gifts we received during our family get-together on Saturday. From my parents - a new black coat (I actually picked this out myself shopping with Mama one day). I've been wanting a new coat for a few years but haven't taken the time to shop for one, so I am thrilled with this gift. As you can see, there was no shortage of helpers when it came to unwrapping gifts! Robbie got a multipurpose power tool from my parents. Daddy bought himself one of these several months back and has enjoyed it so much that he got one for Robbie and one for my brother-in-law. There were lots of goodies in my bag including candles, a puzzle, dish towels, and a water bottle that matches the bag, but my favorite is this framed portrait of my three youngest nieces. 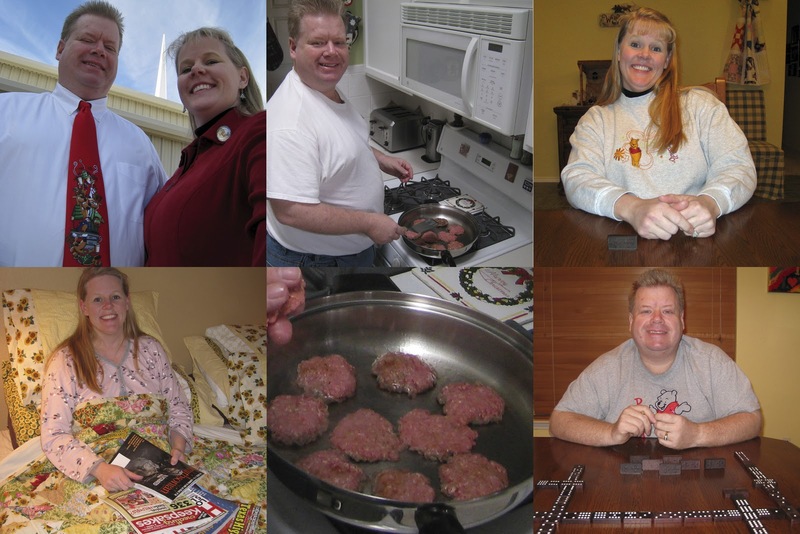 I have to admit that we went a little overboard with the camera and took about 500 photos that one day. I know there are quite a few that can be deleted because they are blurry or near duplicates, but I'm thrilled with all the great opportunities these photos will provide for scrapping in the new year! Here's one of my favorite photos from the day. 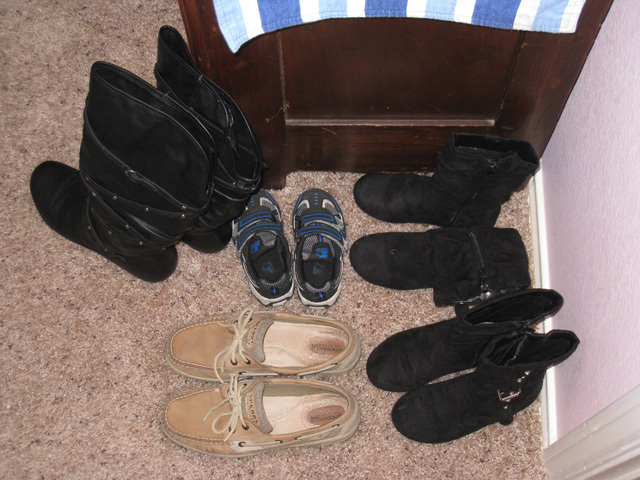 Anytime the nieces or nephews are visiting, they usually keep their shoes right inside the guest room door, right where all their shoes were on Saturday! We hosted my family here for our Christmas Get-Together. Everyone in my family (with the exception of my younger sister) was here for a day filled with gifts, food, fun, laughter, smiles, reading, coloring, singing, and even some performances - a monologue by Pun'kin Natashia as the innkeeper on the first Christmas Eve, Christmas carols by the twins and Natashia, and a skit to Room For A Little One featuring Aunt Melissa & Uncle Robbie with all the nieces & nephews! It was a wonderful day and I am so grateful that my family traveled from three cities scattered across the state so we could all be together. Now that the gifts have been opened, I'll share the other two sets of handmade gifts that I created this year. (You can see my Cookies-In-A-Jar gifts here.) I have to admit that I was a little nervous about the gifts - this is the first year EVER that I have made my Christmas gifts! My family is very talented and over the years I have received numerous handmade gifts (quilts, pillow cases, pajamas, spices, ornaments, etc), but this time I was on the giving end. First, I created altered CD Christmas ornaments. I made one of these for the Ladies Ornament Exchange and one each for Natashia, Paige, Laurie and Andrew (plus one for our Santa tree!). I shared a sneak peek of my supplies back in October while I was working on these gifts. I used a circular text path and digital pager from Jessica Sprague and added a photo of my favorite Santa figurine to create the front circle. Then I printed circles of the same digital paper to cover the back of the CDs. I stamped the back and cut letters to personalize the ornaments. While Andrew is still too young to really get the concept of a personalized ornament, I think the girls all liked theirs. Natashia was quick to be sure they were all wrapped back up carefully so they wouldn't get damaged in all the excitement of opening gifts. The other set of gifts I made were personalized altered clipboards for all the adults in the family. This project took a couple of weeks, but I was very pleased with the results. First, I chose papers for each clipboard, which was one of the most difficult steps as I tried to personalize the color and theme for each person. 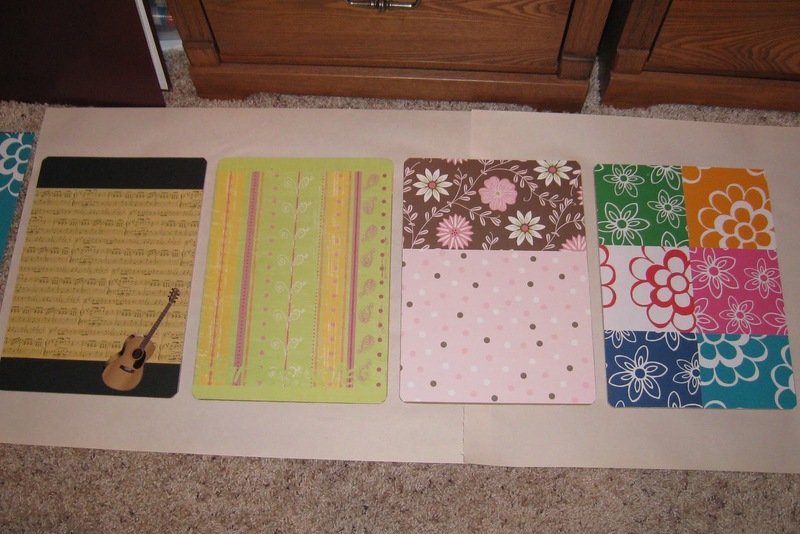 Once I had all the papers chosen and cut to size, I adhered them to the clipboards. This process was made much easier because Robbie took the clips off the boards. I then inked the edges of the clipboards and left them to dry overnight. The next step was to add modge podge over the papers and edges. I did one side of the clipboards and let them dry completely, then coated the other side and the edges. [If When I make these again, I will probably paint the clipboards before adhering the paper as the ink made quite a mess when I added the modge podge.] Once they were completely dry, Robbie re-attached the clips and I began to decorate each one. Daddy's clipboard is covered in musical paper and notes. All my life, Daddy has sang and played the guitar at church. He has sang with church choirs and played with the worship team and most often performs solos of Southern gospel or contemporary worship songs. The one thing I missed most about church when I no longer lived close to my parents was seeing Daddy on the platform playing the guitar and hearing him sing some of my favorite songs. Daddy really liked the musical notes papers on his clipboard. Mama is a sewer and quilter. 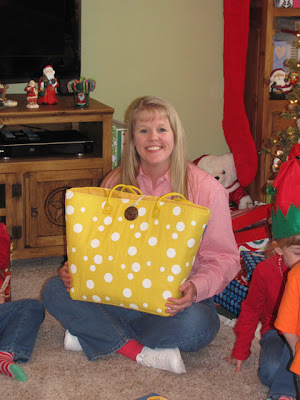 When we were little, she sewed clothes for me and my sisters (which I think we didn't fully appreciate at the time!). My house if filled with wonderful things she's made over the years - crocheted afghans, quilts for every bed in the house, pillowcases, dust ruffles, and stuffed bunnies. I'm dreaming of the day she feels the urge to take a break from quilting (her current pursuit) and will make me some new dresses. She always chooses wonderful materials for the items she makes, so I chose papers that reminded me of pretty material for her clipboard. 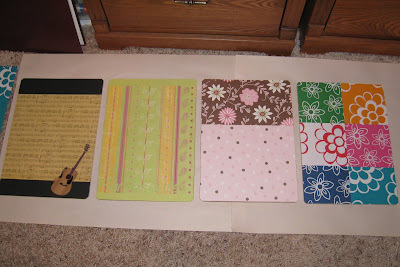 Mama said she is going to use her clipboard to hold quilt patterns for the projects she's working on now. My sister is also a whiz with the sewing machine and makes quilts that will rival any you've ever seen. I have a beautiful quilt that she made on display in our front room and my favorite pajamas were her handiwork several years ago. I wanted her quilt to resemble a happy patchwork quilt and chose to use six different papers. She seemed to really like it and immediately knew where she was going to hang it in her sewing room so she could clip up the pattern for the different quilt blocks she makes. My brother-in-law has always worked in construction and several years ago transitioned into an office position within the industry involved with more planning and drafting. (Ok, I know that's pretty vague, but I'm not totally sure about all his job duties!) 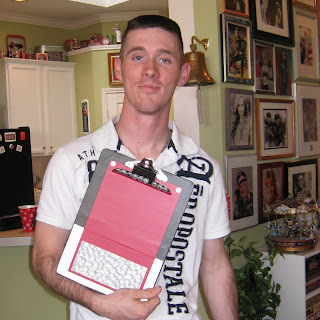 He's also a good carpenter and handyman, so I wanted his clipboard to be one that he could use at work if he wanted to or that would look great and be useful hanging above a workbench. He's not really one to say much, but the photos of him opening the gift and showing it to my sister indicate that he liked it. For my nephew, the Houston Astros fan, I used the Astros colors and some neat bottle top letters. He told me he was very impressed with the gift as he had not seen anything like it and they were all personalized (yes, I almost cried at such a wonderful compliment from a 23-year-old!). His office space at his house is always decorated in a sports theme, so he especially liked the fact that this was one office supply that could be left out and would look good. 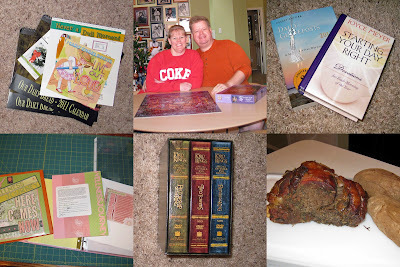 Robbie and I received some wonderful gifts, which I'll share with you tomorrow since this post is already fairly long!